I don’t think they saw this coming. When Congress passed the Mother’s Day resolution in 1941, I bet they never envisioned that it would evolve into a multi billion dollar spending spree with Americans projected to spend $23.6 billion this year – which tops last year’s record of $21.4 billion. 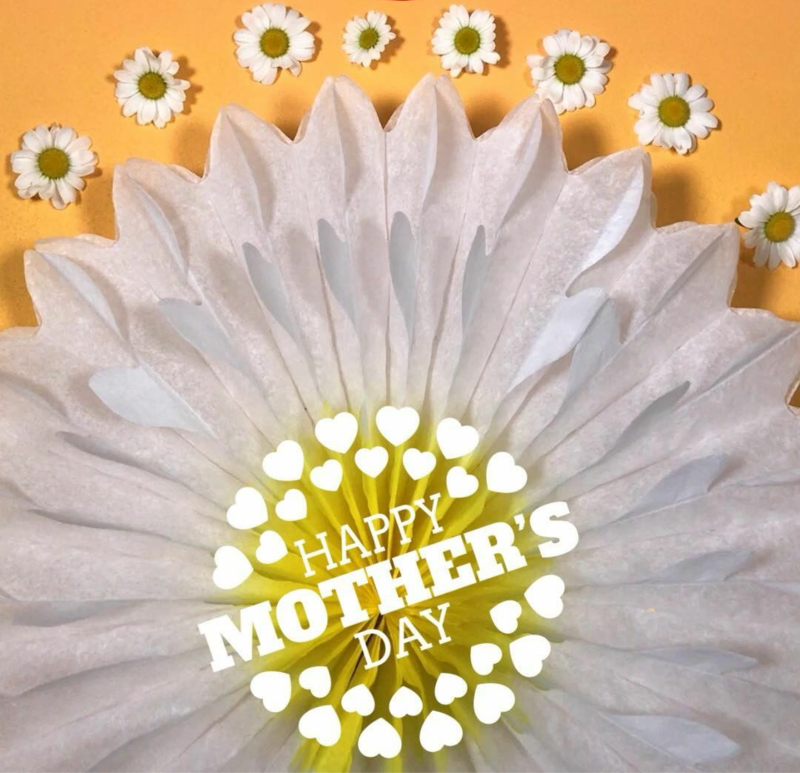 That’s according to the National Retail Federation (NRF), a trade organization that has been keeping track of consumer spending of Mother’s Day gifts since 2003. The NFR estimates that over of half us have plans to dine out at a special Mother’s Day brunch or dinner. But alas, if you haven’t made reservations to take mom or the mother figures in your life to that brunch or dinner, chances are you are out of luck. Most of the best spots are booked. No worries. You can make a reservation at home and book that old Crock-Pot to make a Mother’s Day meal she will love, one that looks like a labor of love without much labor. 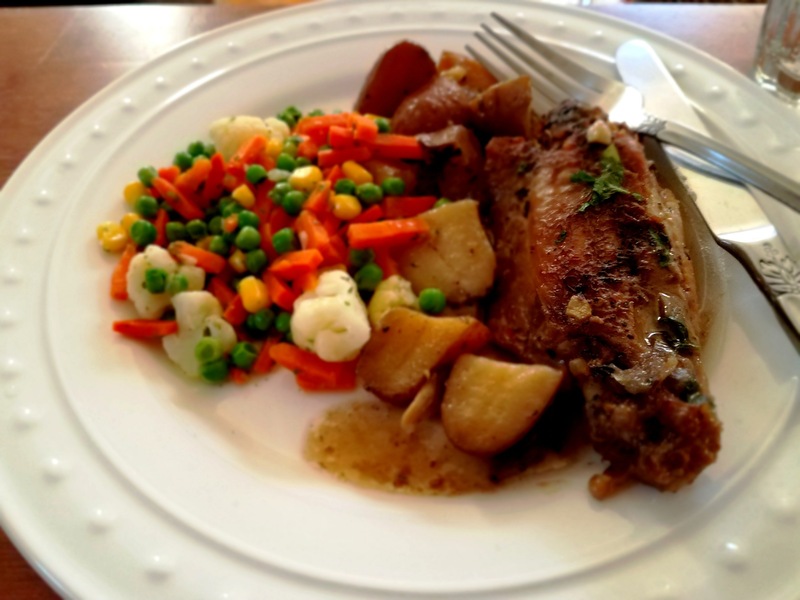 My Smothered Turkey Wings with Fingerling Potatoes are a Crock-Pot delight. Simple ingredients make it delicious and soul satisfying. Add a little red wine and elevate it to a restaurant quality entrée that is Mothers’ Day worthy. The best part is the Crock-Pot does all the work – that is after you add the ingredients to it. Serve this dish with a lovely salad, mixed vegetable medley and garlic bread and you’ve got dinner – well, she’s got dinner to be more exact. Happy Mother’s Day! And by all means, post a picture on Facebook, Twitter or Instagram with the hash tag #collardgreenscaviar and let me see your handy work. Or send an email to collardgreensandcaviar@gmail.com and I will post it on my social media sites. Easy, delicious and perfect for a special Mother's Day meal. 1. Set up Crock-Pot. Turn setting to low. 2. Separate wings into portions. Discard tips or save for soup. 3. Add three tablespoons of oil to a non-stick skillet. Place skillet on stove top and set heat at medium. 4. Generously season each side of the meat with salt, pepper and garlic powder. Place a piece of parchment or wax paper on a cutting board and about a cup of flour on the paper. Thoroughly coat each wing portion in flour. Add to the skillet and cook on each side until dark brown. Don’t be afraid to brown the meat. Remember: color equals more flavor. 5. When browned, remove from heat and place in large crock pot. Add more oil as needed.Continue until all pieces are browned and nestled in the crock. 6. Add chopped potatoes, onions, garlic and herbs to the Crock-Pot. Pour chicken stock and wine (if you are using it) over the top of the turkey and vegetables. Season the top with about 2 teaspoons of salt and ½ teaspoon of pepper (cracked pepper featured here). 7. Dot top with butter. Cover and cook on low for 6 hours. 8. Once done, remove wings and potatoes and place in large baking dish, with wings being on one half of the dish and the potatoes on the other half. 9. Pour the gravy that remains over the turkey and potatoes. Garnish with fresh chopped parsley. Note: For thicker gravy, whisk together 2 tablespoons of flour with 2 tablespoons of cold water in a coffee cup or small bowl, then whisk mixture into the gravy before pouring over turkey and potatoes. Top left: seasoned turkey wing portions. 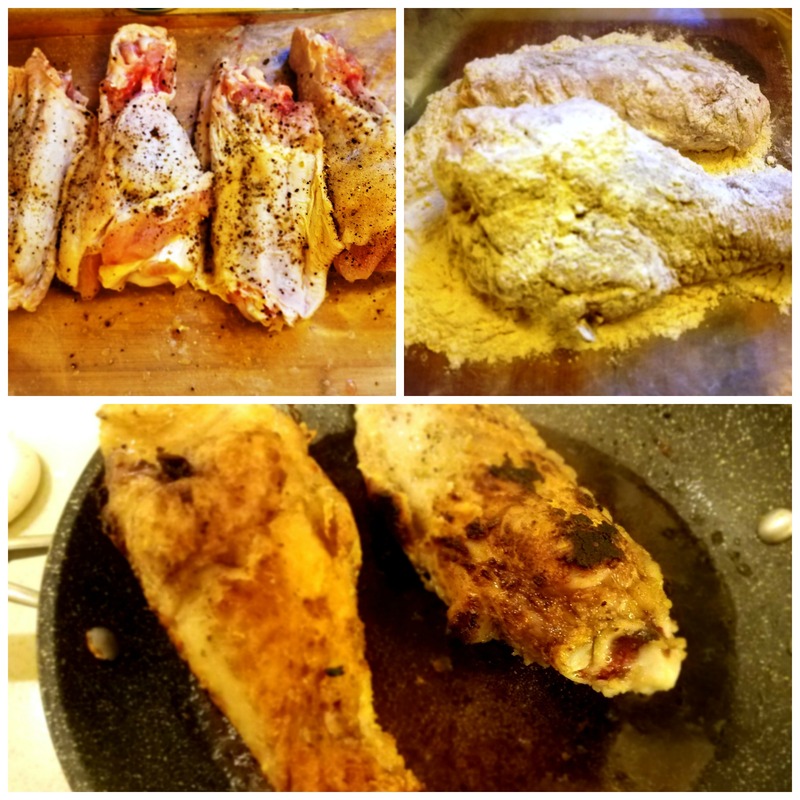 Top right: turkey wing portions thoroughly dredged in unbleached flour. Bottom: turkey wing portions panned seared until dark in color. Remember: color equals flavor! Top left: Once turkey wings are browned, add to Crock-Pot. Top right: Chopped herbs and vegetables make this dish savory and soul satisfying. 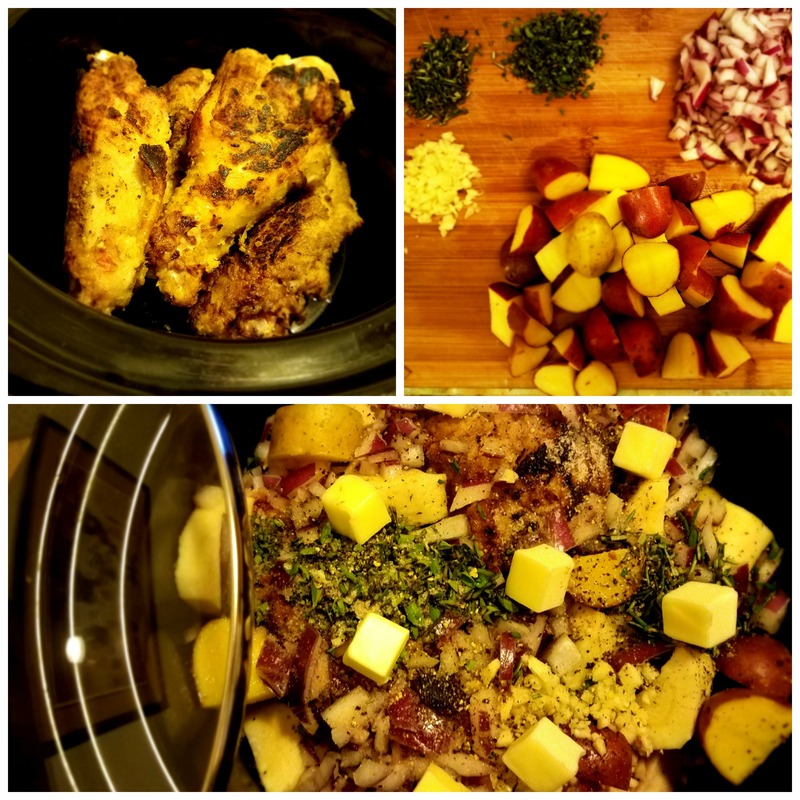 Bottom: All ingredients added to the crock including vegetables, herbs, chicken stock, red wine, salt, cracked pepper and 2 tablespoons of butter cut in cubes and dotted on top.